January 9, 2012 at 6:55 pm Add a comment! 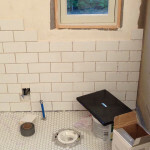 We are planning on splitting the long, narrow room (6 ft x 14 ft) into a power-room and a master bath. The walk-in shower and toilet along one wall, with a vanity along the other. 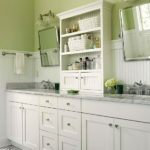 The vanity may be as picture, with two sinks and a wall unit between them but we are also considering pedestal sinks and antique furniture redone to be a vanity. We’ll see what we end up with! The powder room is small with a toilet and a small pedestal. Some storage above the toilet for hand towels and toilet paper and we’ll call it good. Here is one inspiration image(from BHG). Imagine a shower, that shape and size (but with shower head upgrade for sure!). 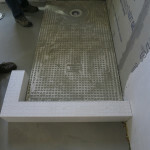 The toilet would be to the left of the shower, where the bathtub is in the image. There is a rather large window above the toilet which will need an appropriate window covering. 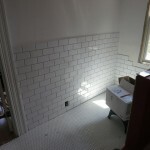 I want an all-tile shower with penny tile floors and white subway tile walls. The 1/2 wall with the glass and the glass door is what I’m thinking. Another reason I love this image, look at that monogram. I love it. Modern but traditional. Bold but still formal. I need to see if Mom and the embroidery machine can get cracking on those! Love Em! 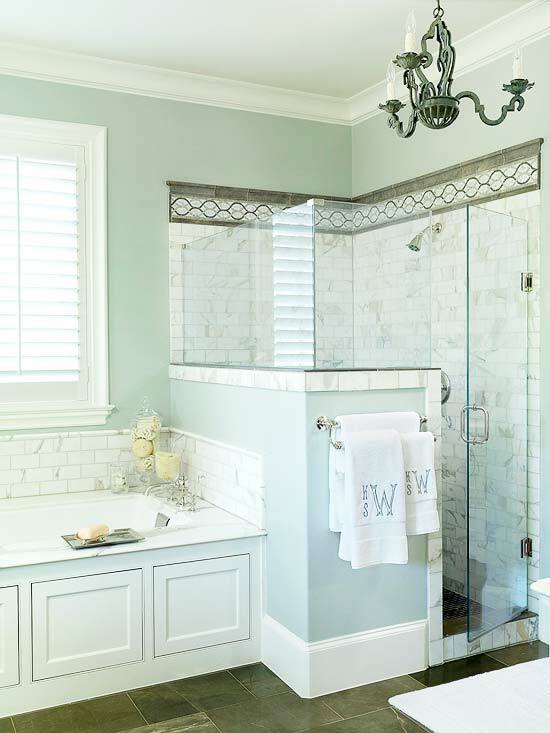 Perfect bathroom needs exceptional level of cleaning service. Check out benefits of using Maid Easy for ultimate cleanliness. That’s the thinking for today!